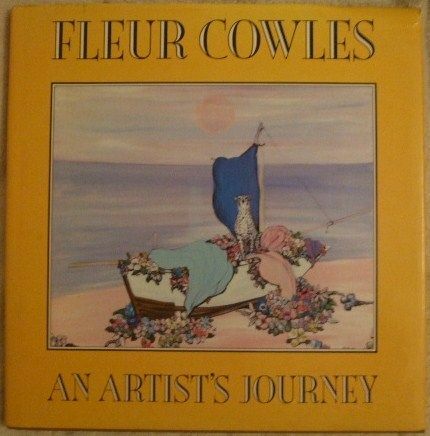 First edition, first print hardback of AN ARTIST'S JOURNEY, by Fleur Cowles and published by William Collins Sons & Co. Ltd., London, in 1988. Illustrated with line drawings within the text and 49 full page colour plates. The book is in very good condition (clean dark orange cloth boards and gold lettering on spine, very slight liquid stain to the bottom corner) with only slight wear to the dust jacket, which is not price clipped (light creasing to the edges and a small part of the spine, fingernail closed tears to the top and bottom front corners, all fairly minimal). Internally, the pages are clean and tight and there are no tears. There is a previous owner's very short inscription in red ink on the corner of the front endpaper. Fleur Fenton Cowles (1908 – 2009) was an American writer, editor and artist best known as the creative force behind the short-lived Flair magazine. Cowles founded Flair magazine in 1950, and it folded a year later. The magazine, which Time described at its launch as "a fancy bouillabaisse of Vogue, Town & Country, Holiday, etc.," was celebrated not only because of its design and editorial production by European art director Federico Pallavicini but also because of its lavish production. It was the resulting cost of production that killed the magazine, since the expensive special costs (for cover cut-outs for some issues, for example) could not be supported in the long run. This magazine is now sought after by collectors. Contributors included Saul Steinberg, Salvador Dalí (The Gypsy Angels Of Spain), and many writers and artists who subsequently became well known. As Fleur Fenton Pettingell and Fleur Cowles Meyer, she worked as a painter and illustrator. She also designed tapestries, accessories, and china for Denby Ltd.
"Art, artists and art collections are the abiding passions of the painter, Fleur Cowles. Her Artist's Journey is, at once, a chronicle of her own insight and success as a practising artist, and an often hillarious, frequently tender, series of memoirs of the many artists and their work who shaped her imagination, both as a painter and a collector, through the years. Forty-eight of her own best-loved paintings magically realize her world of mystical beasts and mysterious fantasies. Her paintings fit none of the usual art classifications, although they have been called naive, surreal, realistic, literary and illustrative. The truth is that Fleur Cowles is an original, who creates her own world on canvas. Why shouldn't an elephant perch in a tree or unicorns gambol in a meadow? The same playful imagination engages entertainingly with Braque, Picasso, Sutherland, Lucian Freud and Dali, as Fleur Cowles recounts her meetings with some of this country's finest artists. Always alert to new talent, and valuing the friendship of an artist as an indispensable bridge to a true appreciation of his work, she also explains the link between her own art and her intent as a collector. As the associate-editor of Look magazine and the creator of the immensely innovative Flair magazine, she brought her own private interests into public eye, and in the process opened many a closed door to aspiring artists. Artist's Journey provides a compendium in text and image of all that is most exciting in such a rich life. 10½" x 10½". 128 pages.